The House of Romanov was the second imperial dynasty of Russia, which ruled the country for five generations from 1613 to 1761. The Romanov imperial dynasty was regnant in the male line from 1613 to 1730, and thenceforward in the female line, variously termed Holstein-Gottorp-Romanov [443,000 attestations], Oldenburg-Romanov [246,000], Romanov-Holstein-Gottorp [104,000], Romanoff-Holstein-Gottorp , Romanov-Oldenburg , or Romanoff-Oldenburg. From 1761 to 1917, Russia was ruled by a line of the House of Oldenburg descended from the marriage of a Romanov grand duchess to the Duke of Holstein-Gottorp. This line was officially also called Romanov, although genealogists sometimes style it, more accurately, Holstein-Gottorp-Romanov. In his early days. Peter was accused by the regent Sophia of introducing German customs ; he always liked to wear German clothes ; idle gossip said that his father was a German surgeon. The Russian Academy of Sciences, which he founded with the aid of German and a few French scholars, has issued its publications in German until a recent date. The new administrative terminology, necessitated by Peter's reforms, was largely borrowed from his western neighbor. From that time until now the rank of Russian army officers lias been designated by German titles, while hofmeister, Stallmeister, kammerjunker, kammerfrau were naturalized in the usage of the Russian court. Even the new capital, symbol of all his dreams of a westernized Russia, was called St. Petersburg. Since the time of Peter the Great (the beginning of the eighteenth century) the influence of Germans in Russia had been growing. The German element was gaining predominance in the bureaucracy, marriages with German princes and princesses were contracted by members of the dynasty; in the eighteenth century the male line of the house of Romanov (which had been on the throne since 1613) died out, and by the marriage of a Romanov heiress with a member of the Oldenburg dynasty the house of Holstein-Gottorp, a new dynasty, a German one, came to the throne. Peter's elder daughter, Anna, married Charles Frederick of Holstein-Gottorp. When Anna, widow of the German Duke of Courland, came to the throne in 1730. the court became a facsimile of Berlin. Ernst Biren. her lover, was made chamberlain, Lewenwold majordomo of the court, Ostermann had charge of foreign affairs, Korff and Kayserling were heads of embassies, Lascy, Munnich of Oldenburg, Bismarck and Gustav Biren, generals. In the corps of cadets for young nobles founded by Munnich, the history of Germany was taught to the exclusion of that of Russia. Some of these men, like Ostermann, were real statesmen, but many of them were mere adventurers, devouring the substance of Russia like a swarm of greedy locusts. The succession devolved in 1741 on Elizabeth, daughter of Peter the Great. An anti-German reaction had placed the Empress Elizabeth on the throne, and the land had rest from Teutonism for twenty years. When she came to die, however, she could do no better than appoint as her successor, Peter III, the son of Peter's elder daughter Anna and Karl Friedrich Ulrich, Duke of Holstein-Gottorp (belonging to a cadet line of the family of Oldenburg), with whom the half-German dynasty of Oldenburg-Romanov or Holstein-Gottorp began in 1762. Peter III established the dynasty of Romanoff-Oldenburg, which ended with the deposition of Tsar Nicholas II in March 1917. Peter III had a short and unpopular reign. 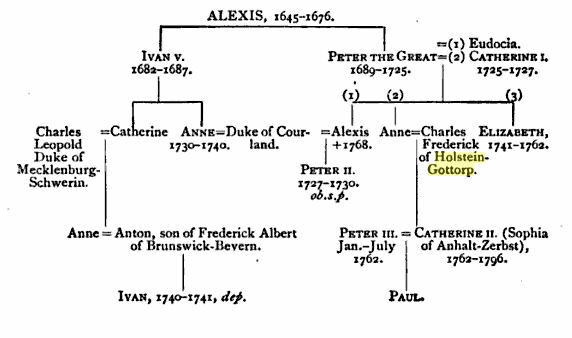 Although he was a grandson of Peter the Great, his father was the duke of Holstein, so Peter III was raised in a German Lutheran environment. Russians therefore considered him a foreigner. Making no secret of his contempt for all things Russian, Peter created deep resentment by forcing Prussian military drills on the Russian military, attacking the Orthodox Church, and depriving Russia of a military victory by establishing a sudden alliance with Prussia. Making use of the discontent and fearing for her own position, Peter III's wife, Catherine, deposed her husband in a coup, and her lover Aleksey Orlov subsequently murdered him. Thus, in June 1762 a German princess who had no legitimate claim to the Russian throne became Catherine II, empress of Russia (1762-96). After the termination of the reign of Elizabeth, daughter of Peter the Great, in 1762, the official representatives of the Russian national interests and aspirations, the tzars, were half alien and Romanovs only by courtesy, or better by presumption. In reality they were Holstein-Gottorp-Romanovs, issuing from the marriage of a daughter of Peter the Great and a prince of Holstein-Gottorp. They invariably married foreign princesses, mostly German. As a result they were at best only conscientious functionaries and not real leaders of the Russian people whom they never really understood. They loved Russia in their own way, but their love was similar to that of a plantation owner for his plantation and even for his slaves. Under the German Catherine II, consort of Czar Peter III, Russia was recognized as one of the Great Powers. Catherine introduced Western art and literature, accomplished administrative reforms, allied herself with Prussia, England and Denmark, and secured a considerable share of Poland. Under Alexander I (1801-25), liberal reforms were attempted: the Council of Empire was erected, the idea of a constitution was discussed, schemes of education proposed, and emancipation of the serfs begun in the Baltic provinces. He resisted Napoleon at first, but concluded with him the Treaty of Tilsit, by which he hoped to divide with Napoleon the control of Europe. His pretensions to power, however, caused Napoleon to undertake the campaign of Moscow, which brought Napoleon to Waterloo and Alexander to a predominant position in European politics. Nicholas I (1825-55) reacted from the liberal policy of Alexander, reformed the army and navy, constructed railways and advanced industry and commerce. Alexander II (1855-81), emancipated the serfs, reorganized the judicial administration and inaugurated local self-government, relaxed the strict censorship of the Press under which a new imaginative and critical literature arose, producing some of the greatest writers in all literature (Tolstoy, Dostoievsky. Turgeniev). These reforms, however, had to work slowly, and the Government announced that nothing more was to be done until the country had time to adjust itself. This produced great dissatisfaction among the younger generation, filled with vague ideas of an indeterminate millenium. and the reaction led to the rise of Nihilism. Though Alexander,s foreign policy was not successful in Europe, in Asia it won for him Siberia. Upon the assasination of Alexander II, Alexander III succeeded and entered upon a frankly reactionary policy, and his successor, Nicholas II (1894), endeavored to combine the policies of his father and grandfather. He strengthened relations with France, joining the Triple Entente, and endeavored to extend Russian influence in the Far East, but received a severe check in the Russo-Japanese War of 1905. The old liberal movements and conspiracies now began to revive, and the Government decided to issue the Manifesto of October 30, 1905, promising to convoke a legislative assembly. The first Duma met on May 10, 1906. The House of Oldenburg-Holstein, which had furnished so many sovereigns to Europe and counted among its members the Kings of Denmark, Greece and Norway, wasn very closely connected with the Russian royal house. All the Czars since Peter III married German princesses and hence German and Danish influences had been very pronounced in Russia during the 19th century. Alexander III married Princess Dagmar of Denmark, and their son, Nicholas II, was thus connected with the royal family of Denmark, and through his aunt, Queen Alexandra of England, with the English royal family. Of the six Tsars who have ruled since Catherine, all but one have had German wives. Paul married Maria of Wurtemberg, Alexander I Louisa of Baden, Nicholas I Charlotte of Prussia, Alexander II Wilhelmine of Hesse-Darmstadt, and Nicholas II Alix of Hesse. Alexander III, whose queen was Danish, forms the only exception, and he was the most nationalistic of them all. In the policy of these emperors, with the doubtful exception of Alexander II, proGermanism and reaction have gone hand in hand. Paul, though an admirer of Napoleon, was so wedded to the Prussian army system that he introduced the uncomfortable Prussian uniform of the period, to the intense dislike of sturdy old Suvorof, his great general, who exclaimed: "Wig-powder is not gun-powder ; curls are not cannon ; a pigtail is not a sabre ; I am not a Prussian, but a Russian born." Alexander I, who was fond of Frederick William III and Queen Luise, saved Prussia from national extinction at Tilsit, even at the expense of Russian aggrandizement. His break with Napoleon was partly occasioned by his insistent support of the German Duke of Oldenburg, who had lost his throne through disobedience to French wishes. Though the Slavophiles were blackened and opposed at once by the half-alien, largely Germanophile court circles and by the revolutionaries, yet they tried to teach the doctrine of the mission of Russia to liberate Constantinople (Tzargrad), the spiritual fatherland of the Russian Orthodox Christianity, from the rule of the infidel and to restore to its pristine glory Saint Sophia, desecrated by the Turk. The last Tsar of Russia, Nicolas II, was in the male line not a Romanov, but a Holstein-Gottorp. The intimate correspondence between Tzar Nicholas II and his wife was carried on in English evidently because that was the language in which they both could best express themselves. The Grand Duchess Marie (Maria Pavlovna, Jr.) relates in The Education of the Princess that until she was six years old she did not speak a word of Russian and that it was her French governess, the daughter of a patriotic democratic nation, who was horrified at the fact and caused the "Russian" grand duchess to study the Russian language. Small wonder, then, that the masses of the Russian people, governed or rather misgoverned by the half-alien tzars, not only were not taught any doctrine of political mysticism, but were left in dismal ignorance of the vital national interests of Russia.